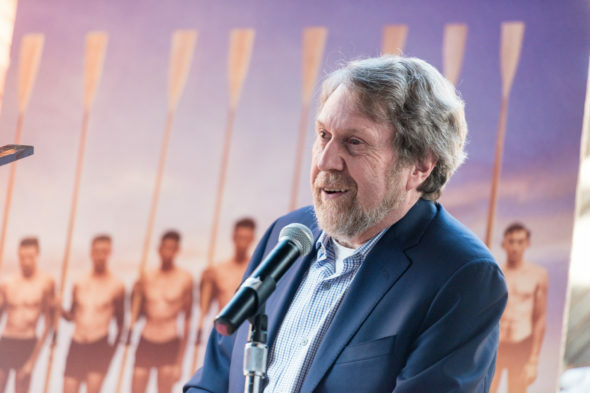 Daniel James Brown’s book, Boys in the Boat, inspired tourists to visit the University of Washington and helped fuel a $10 million renovation of the old shell house. A few months after his national nonfiction best-seller, The Boys in the Boat, was published in 2014, Seattle author Daniel James Brown was showing a friend around the Conibear Shell House on the University of Washington campus. They looked at the trophies accrued over decades by successful Huskies teams, and gazed upon the legendary Husky Clipper, the shell used to win gold at the 1936 Berlin Olympics under the grim glare of Hitler. Brown also saw a couple of groups of people walking into the building, seeming to seek the same experience of absorbing UW rowing’s history. He thought it was a coincidence, until someone told him inquisitive visitors were a now a regular feature at Conibear. The interest in the book and the history it recounts so compellingly have done more than draw tourists. It has inspired a $10 million campaign to restore and upgrade the ASUW Shell House, just south of Conibear on the Montlake Cut, now a storage building but in 1936 the main stage for the story (Read: Re-imagining the home of ‘Boys in the Boat”). “It was a seaplane hangar, so there’s a connection with aviation,” Brown said this week. “George Pocock built wooden pontoons for some of those early seaplanes. The workshop is still in the loft, so it ties in boat building and working with cedar. 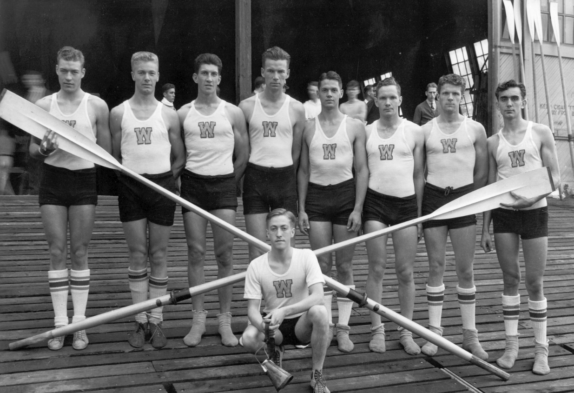 It’s at the center of the rowing and boating culture of Seattle. Creation of the book had its own drama. Brown happened to live next door to a woman named Judy Willman. Her father was Joe Rantz, a rower in the 1936 eight-oared shell who became a central figure in the book. Rantz knew one of the people (Angus Hay, Jr.) Brown wrote about in another book, Under a Flaming Sky: The Great Hinckley Firestorm of 1894. He asked his daughter to set up a visit. The men discussed Flaming Sky for a few minutes, but eventually began discussing Rantz’s days as a UW rower. As details piled up, Brown knew he had come upon a great story. That thought was confirmed when Brown’s proposal for the manuscript created a bidding war to acquire its rights. A deal was struck with Penguin Viking. But at a meeting with the publisher’s marketing staff, Brown’s enthusiasm dwindled. Discouraged, Brown returned home and searched online for collegiate programs and rowing clubs. He was pleasantly surprised to find hundreds of organizations. Five years later, the book is the launching pad for the extensive remodel and repurposing of the original crew house from 1919. Brown is delighted that a building that witnessed so much history is under consideration for revival. And, someday, a feature film. Brown sold the movie rights seven years ago to The Weinstein Company. But the sexual assault and misconduct allegations in 2017 against co-founder Harvey Weinstein ignited a national scandal and sent the company into bankruptcy in March, putting all scripts and projects in limbo. An auction for the company’s assets is underway this week, which drew interest from 23 bidders. Once an auction winner is selected, Brown hopes the film can get back on track. Meanwhile, he’ll watch the the building project with pride and enthusiasm. He said he dreams of one day walking into a gift shop at Sea-Tac Airport and finding a mug for sale with the Space Needle on one side and the renewed Shell House on the other.